Our kosher, gourmet meals are delivered directly to you fully cooked/baked and elegantly arranged. They will arrive already frozen and can be stored as is in the freezer. 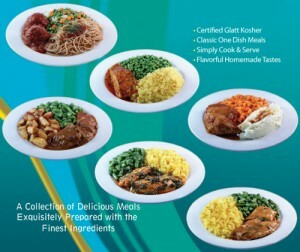 When the costumer requests a kosher meal, they will have a variety of menus to choose from. The meal is then placed in a oven or microwave oven for a few minutes — and there you have a piping hot, kosher gourmet meal that tastes and looks as if it was just freshly cooked especially for the guest. Our options also include vegetarian, gluten free and diabetic meals. The elite grade meals are elegantly arranged on china dishes, and each serving is individually double sealed and placed in a small box, together with a set of metal cutlery. The standard meals are packed in compartmentalized trays. The price includes the china plate and cutlery, as well as well as two dinner rolls which go along with the meal. 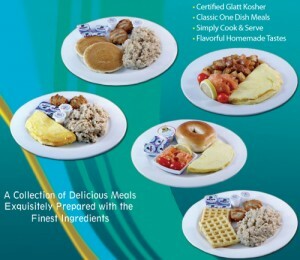 Offering in house, hot kosher meals will naturally attract a larger clientele of kosher consumers to the hotel. If you wish, a neat, elegant stand that reads “Ask for our full kosher menu” can be placed in the restaurant to notify guests of the option. Molly’s Gourmet Meals is committed to providing delicious Glatt Kosher Foods that maintain flavor, texture and appearance for your dining pleasure. The following easy handling procedures will enable your food server to present the foods in a respectful and dignified manner that will guarantee kashrus & customer satisfaction. All food products are wrapped and sealed in a kosher certified package and need to be thawed before serving. Foods that require heating are sent in Dual Therm Containers that are microwaveable / oven-safe. Recommended heating is 250 Fahrenheit Degrees for 45 minutes, not to exceed 350 F Degrees. Meals can be heated in a standard oven with a CLEAN steam table or sheet pan, wrapped in aluminum foil. For microwave use, place meal on paper doily. Heat from 1 to 5 minutes or until completely hot. Important notes: Product needs to be completely heated in order to enjoy the full flavor and quality of the food. After heating, products can be held in a holding cabinet for 2-3 hours at 180 degrees. Service is known to be an important part of any dining experience. Kosher guests also deserve the same treatment. Although meals are heated in a Kosher Certified package, it can be presented with the special touch of elegance that the facility’s wait staff provides. Waiters bring the guest the heated meal placed on your regular dinner plate with a paper doily and your standard plate cover. This enables service of a hot meal. At the time of service, the waiter presents the meal to the guest, showing that it is sealed in the Kosher Certified package. Then, the waiter suggests that the meal could be opened for the guest’s convenience. It should be opened on a side stand; after wrappings are removed, the food tray should be presented to guests. 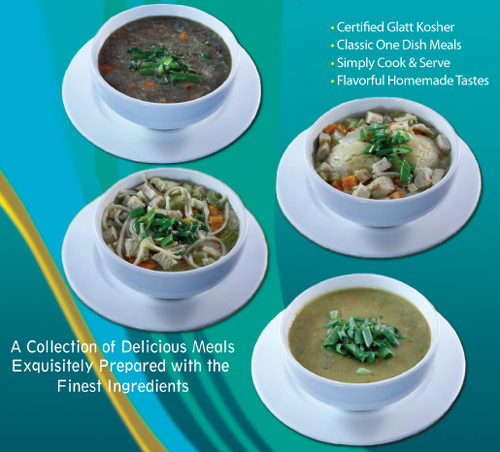 Molly’s Gourmet is Glatt Kosher, Cholov Yisroel, Pas & Bishel Yisroel. We are certified by The OU and the ORB, which is recognized worldwide for its high standard of Kashrus. We are available to assist you with any questions pertaining to Kosher products or handling procedures; please feel free to contact us.